The animated eggs-travaganza will make the hop to Blu-ray just in time for Easter. 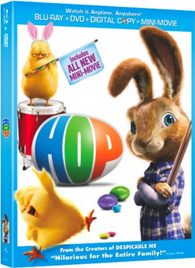 In an early announcement to retailers, Universal is releasing 'Hop' on Blu-ray on March 23. E.B. (Russell Brand), the Easter Bunny's teenage son, heads to Hollywood, determined to become a drummer in a rock 'n' roll band. In LA, he's taken in by Fred (James Marsden) after the out-of-work slacker hits E.B. with his car. The Blu-ray/DVD/Ultraviolet Digital Copy will feature a 1080p video transfer, a DTS-HD Master Audio 5.1 soundtrack, and supplements will include: all-new mini-movie: Phil's Dance Party, "Post Coup Commentary" with Carlos and Phil, The World of Hop interactive map, All Access with Cody Simpson, Russell Brand's Kid Crack Ups, three behind-the-scenes featurettes, and three interactive games. You can find the latest specs for 'Hop' linked from our Blu-ray Release Schedule, where it's indexed under March 23.